I read this book both in its Alpha stage, and the finished article, and I loved it both times. We follow along behind 2 main characters. The first is pissed off princess, Anya, who is not very taken with the idea of being married off for political gain. Luckily for her she spent most of her childhood in a convent of nuns who held a number of ancient dark magic books in the library. Whether Anya was meant to read them or not… she did, and now she’s angry and armed to the teeth with magics the world hasn’t seen in a very long time. So, instead of heading off to marry Prince Charming, Anya decides to BREAK THE WORLD (caps make things important!). It’s a fairly extreme measure, but then Anya isn’t your standard Disney princess. Our second character is Caida, a sword monk with a tragic backstory. The sword monks believe that the sword they wield is a representation (both literally and figuratively) of both their soul and their faith. Caida wields a great sword that most men would struggle to lift. There’s a metaphor somewhere around here. Caida is young and inexperienced, but the best warrior the monastery has seen in generations, and the monks in charge have a mission for him. There’s a princess needs rescuing… You can probably see where things are going from here. The concept of Caida’s sword being his soul is a brilliant one with a lot of scope for interesting development, especially as his faith begins to waver some. 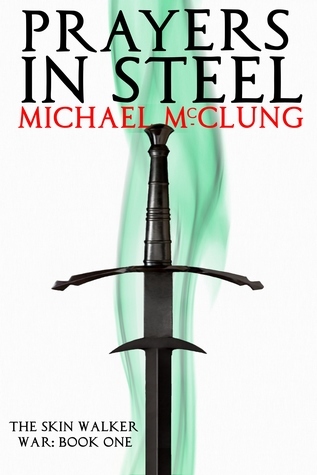 McClung does an excellent job of getting across Caida’s reverence both for his sword and his faith, and regularly hints at something deeper within Caida’s heart, something he doesn’t quite know is there himself… yet. The story is set against the backdrop of a battle that is a prelude to war, a war which Anya is trying to instigate. She’s a strong character, hiding naivety and a subtle fragility behind anger and bouts of magical ultraviolence. But McClung hints that she may be as much a pawn as a player in the very game she is trying to break. The story is fast paced and there is always action around the corner. There’s some really imaginative ideas scattered around the place as well, including a magical book that has its own immortal bodyguard, regardless of who is in possession of the book. It’s a fascinating read and I loved it both times I read it. But it has a couple of issues. It feels a bit rushed in some ways. The story doesn’t feel like it kicks off at a natural point and just kind of starts out of nowhere. In some ways this is good as there’s little scene setting or character development before we get to the plot, but it feels a bit off because of it. The character development also feels a bit rushed with backstories thrown in in info dumps that feel a little out of place. 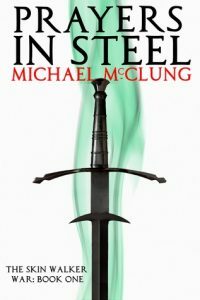 Regardless of its issues, Prayers in Steel is a fantastic book full of devilish magic, high octane battles, and hints at a much grander story waiting to unfold. A well earned 4 out of 5 from me.